Please Note: Westrich Furniture & Appliances serves the Delphos, Lima, Van Wert, Ottawa, and Celina area. Please contact us for delivery and price information. 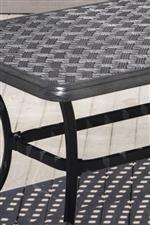 Bring comfort and transitional style to your patio with this outdoor furniture collection. Creating the perfect set for your space is easy with multiple options of table sizes and seating styles. 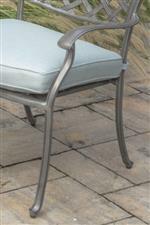 Each piece in this collection is crafted from durable aluminum that is lightweight and rust-resistant. This collection is low-maintenance with stamped table tops to allow liquid to pass through and frames that can be cleaned with just a mild soap and water. Browse other items in the Melbourne by Agio collection from Westrich Furniture & Appliances in the Delphos, Lima, Van Wert, Ottawa, and Celina area.